Swiss state railways SBB runs some local and regional passenger services to and inside southern Germany, they have quite a lot of international EuroCity coaches traveling daily in Germany and their subsidiaries SBB Cargo and SBB Cargo International run quite a lot of cargo trains in Germany. They also rent their locomotives to other private rail operators, so what looks like an SBB machine is not always running in SBB's duty. But SBB's machines can now be found almost in all parts of Germany. The locomotive above is a Bombardier TRAXX locomotive very similar to the DB class 185, but it is classified in the Swiss system as Re 482. It is a multiple electric system machine capable of running all the way from Germany through Switzerland or Austria to Italy. Picture at Hamburg harbour 12.7.2015 by Ilkka Siissalo. 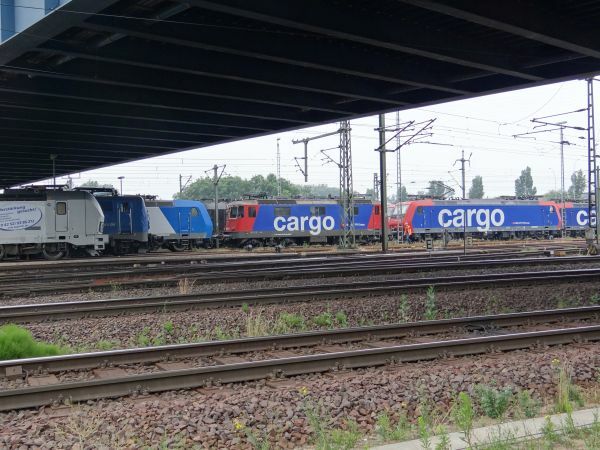 Several SBB cargo locomotives in the harbour of Hamburg. The shorter one on the left with the large lettering "cargo" is a class Re 421. 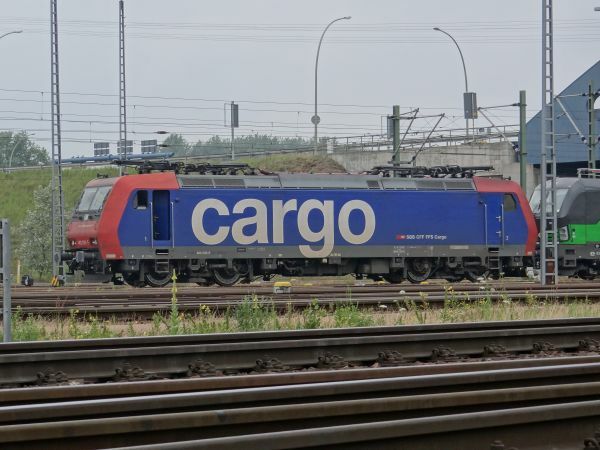 SBB modified the very last batch of their Re 4/4 II locomotives to be suitable for use in Germany and renamed them Re 421. The one on the right and two others behind it are Bombardier TRAXX locomotives of the SBB cargo class Re 482. On the left can be partially seen three other locomotives. The silvery grey in the front is a Siemens Vectron owned by the locomotive leasing company Railpool. The blue one behind it is an old DB class 140 cargo locomotive from the fifties, which DB has sold to egp, Eisenbahn Gesellschaft Potsdam. The blue and grey TRAXX behind it is a class 185 rented by the rail operator ITL. Picture at Hamburg harbour 12.7.2015 by Ilkka Siissalo. 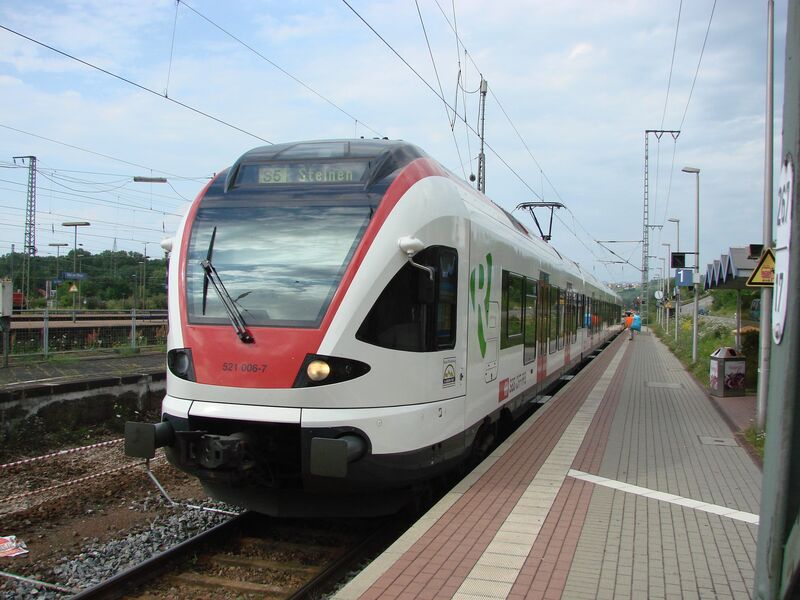 This is the local train of the S5 Weil am Rhein - Steinen. The line is a German local train, but after public tendering the Swiss SBB won the competition to operate it. This is a Stadler FLIRT of the Swiss class 521 waiting at the station of Weil am Rhein for its departure to Steinen. Picture 17.7.2007 by Ilkka Siissalo. 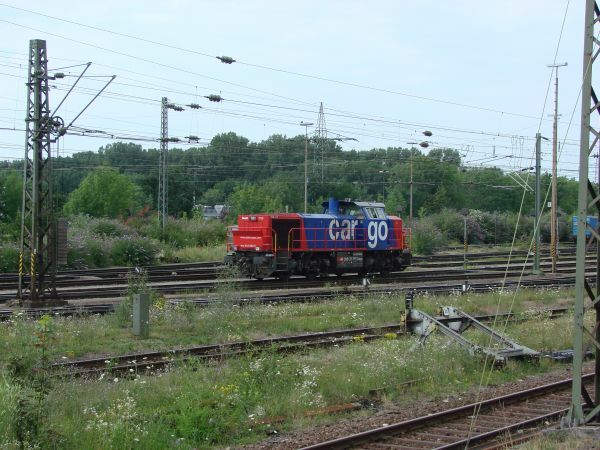 A Swiss SBB Cargo diesel locomotive of the Swiss class Am 843 doing shunting work at Weil am Rhein station in Germany. The Am 843 is made by MaK (Maschinenfabrik Kiel) in Kiel and it is MaK's type BB 1700. Picture 17.7.2007 in Weil am Rhein by Ilkka Siissalo.